Ever wonder why we drive on parkways and park on driveways? Well, finally you’ll have the answer, because even though these two meanings of “park” have come to symbolize opposite approaches to open space use, they derive from a common origin. I recently learned that a “park” was originally a fenced enclosure to claim a piece of open space – often for sporting purposes and for the landed gentry. This use of the word seems to have forked in two directions – one focusing on protected green space, and the other focusing on the idea of a fenced enclosure as a place to “park” livestock and game. Over time this extended to parking military equipment and more recently to vehicles, with or without the fence. Looking at most of our cities, it’s easy to see which definition of “park” dominates. As cars overwhelmed the capacity of traditional cities in the 1930’s, visionary architects imagined and planned future cities in which vehicular traffic and storage would exist below a raised podium on which the healthful city in the garden could flourish. Tall buildings would have access to fresh air, sunlight, views and abundant parks. So much for grand master plans that attempt to create order out of the chaos of our free-enterprise, fossil-fuel-powered American urbanscape. Instead, I suggest that we should try to inject more creative chaos into the existing urban order. At a small scale this already happens occasionally, moments when the rules are bent by the rulemakers and the flexibility of our downtowns surprises us. Think of any time your Main Street is closed for a parade, banners are strung across, and tents are erected along the sidewalk. It seems to be that one of the pleasures of a downtown festival or a once-per-week farmers’ market is the shocking transformation – of the closed-off street or normally mute parking lot – into a vibrant, colorful, community-building plaza-for-people. This periodic adrenaline-rush of street life has long made me wonder about other seemingly subversive, slightly spontaneous, bottom-up approaches to reclaiming and rebalancing our streets. Last week I found one. Enter the five-year old international movement known as PARK(ing) Day. Organizers call it an annual open-source global event where citizens, artists and activists collaborate to temporarily transform parking spaces into public places. They hope to generate critical debate about how public space is created and allocated. I recently participated in PARK(ing) day in Rochester, and while I did not hear much critical debate, I noticed a lot of people throughout the day enjoyed the mildly subversive feeling of reclaiming a 10’ x 20’ rectangle of pavement and demonstrating all the ways it could be put to better use. My architecture firm was invited by Rochester Contemporary Art Center to design this year’s installation, which we titled “OFF the grid/OFF the shelf”. 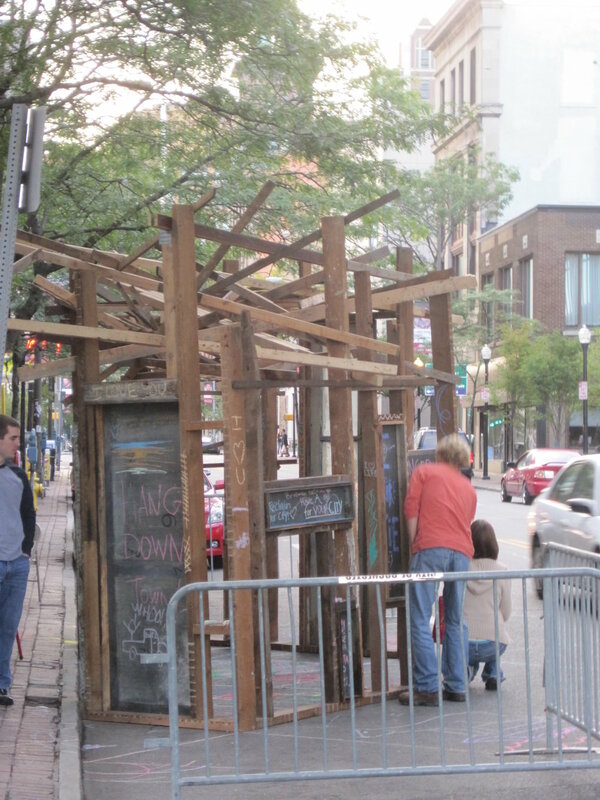 We wanted our PARK(ing) space to engage pedestrians, celebrate art and do our best to dissolve the urban grid. Since our budget was zero (a great way to focus the mind), we used salvaged 2×4 studs and plaster lath, plus leftover slate scraps from a countertop we had made from old school chalkboards. Our makeshift outdoor gallery rose from the pavement in front of the museum by 10am and was gone by 10pm. During that span it hosted a variety of musicians, served a barbecue lunch, provided an impromptu “pocket park” for meetings, and became a literal blank slate (supplied with chalk) for pedestrians’ own artistic urges. PARK(ing) Day transforms parking spaces into public places. This installation in Rochester by In. Site: Architecture extends the art gallery into the street. I like the temporary quality of PARK(ing) Day, its unpredictability, openness, and simplicity. I’d recommend it for any of our smaller downtowns. We need more spontaneity in our lives and on our streets. We could use more bottom-up, no-cost, uncontroversial ideas for reasserting our claim on public space. We’d all benefit from a little more creative chaos, a little more street theater, a little more fun friction, and a little more playful pedestrian participation. In its largest sense, we need to put the “park” back in parking.